Without the SEALs' input, this scene from the video game might show a soldier firing a musket. Since the killing of Osama bin Laden, Navy SEALs have been the subject of two films and a best-selling book, but the U.S. military is drawing the line at participating in the making of a video game. 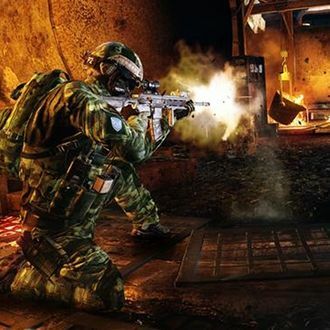 Seven members of SEAL Team Six, including one involved in the bin Laden raid, have been punished for working as consultants on Medal of Honor Warfighter, which EA says was “written by actual U.S. Tier 1 Operators while deployed overseas.” The SEALs have forfeited half of their pay for two months and received letters of reprimand. Rear Admiral Garry Bonelli said that the punishments are meant to “send a clear message throughout our Force that we are and will be held to a high standard of accountability,” — even if it means civilians will be left with slightly less accurate video games.